NOTE FROM THE EDITOR: This blog post was first published on the Georgia Tech Lorraine blog on March 8, 2017, by Samuel Burke. NOTE FROM THE EDITOR: This story by David Mitchell was first published by the College of Computing on March 9, 2017. For Jon Eisen, everything has always been about numbers. The path that led him to speak on behalf of the prominent video game hub Activision, publishers of the popular Call of Duty franchise, at last week’s GVU Brown Bag event has been paved with them. He majored in Applied Mathematics at the Georgia Institute of Technology, graduating with his degree in 2009 and carrying along a Computer Science minor for good measure. He spent time designing RADAR algorithms for Northrop Grumman Corporation in Baltimore, Md., and then worked as an application developer for a short period at Under Armour. Even hobbies in his free time are unique because of specific numbers associated with them. Take the number 50, for example: The number of miles he plans to run in his first ultra-marathon, the Quad Rock 50, in May. While his focus has always been on numbers and equations, though, Eisen said it has been his versatility – merging his background in math and computer science – that has helped him establish a career he’s excited to pursue on a daily basis. He’s worked at Activision for just over a year, where he combines his fascination with raw numbers with a background in video games. As a data analyst, he works to answer questions. For example, does the game play fast? It’s a familiar process for Eisen, who has been a sports fan for years. Growing up a fan of the Atlanta Braves and eventually delving deeper into the world of fantasy sports, Eisen learned unique ways to look at the long list of available statistics. He looks at win probability, value metrics, and any number of additional stats that help answer the question: Are you good? Eisen doesn’t work exclusively in programming, but his understanding of the development side has been a boon to his career, as well. He earned a minor in computer science at Georgia Tech after realizing he was on track to graduate with his degree in Applied Mathematics too early. In his major, he needed only 120 credit hours, and he carried a fair portion with him from high school. He had already pursued a working knowledge in computer science beginning in his freshman year of high school, working with Flash and building websites, including one for rush for his fraternity, Alpha Epsilon Pi, in college. He didn’t pursue a major in the field because, he said, he wanted to learn it all on his own. “I was a kid,” he said, laughing, by way of explanation. With his extra time, though, he focused on computer science courses that filled gaps in his knowledge. He was glad that he did. It’s something he said he has gotten back to doing at Activision. Stavros Garoufalidis started his mathematics education in Greece. As a high-school student, he participated in an International Mathematical Olympiad. He received a B.S. in Mathematics from the University of Athens, Greece. He completed M.S. and Ph.D. degrees in mathematics at the University of Chicago. He joined Georgia Tech in 1999. Fluent in four languages—Greek, English, French, and German—he is also an associate editor at the Journal of Knot Theory and Its Ramifications, as well as an avid beekeeper. My main area of research is quantum topology, which is a combination of studying all three-dimensional shapes, building physical theories about them, and thinking of each shape as a possible universe. 3-D shapes can be described by drilling tubes through a solid (for example, cheese) and then filling them in after possibly twisting. The holes are known as knots in three-dimensional space, that is circles that are allowed to move as long as they do not meet themselves. I have enjoyed collaborating with more than 54 researchers over the years on several projects, discovering new connections and predicting outcomes of difficult computations. One of those predictions involves the number 697, which we found in some numerical computations with Don Zagier, the American mathematician who is now the director of the Max Planck Institute for Mathematics. The number appeared in totally unrelated mathematical physics computations in a different context. The presence of that number gave us confidence that our results are not coincidental, and in fact, they formed the foundation of deep conjectures and theorems in number theory, quantum topology, and mathematical physics. When I was a high school senior in Greece, I participated in the high school math competitions and took part in the 24th International Mathematical Olympiad, in 1983 in Paris. I got a bronze medal and a distinction for a solution to a number theory problem that was originally rejected, but eventually accepted as very original by the committee. I was equally interested in physics and mathematics at that time, but I chose to study mathematics as an undergraduate. Mathematics was clear and conceptual for me. This path brought me to do a Ph.D. in the University of Chicago—my first ever time in the U.S.—where I realized what first-rate research is all about. I continued to be exposed to world-class research at MSRI, MIT and Harvard. There are a lot of misconceptions about mathematics taught at U.S. high schools. I would advise a freshman to learn the concepts of math, not be afraid of real mathematical thought, and to practice proofs and computations. In the past eight years, I have been involved with beekeeping, as a way to stay in tune with nature, seasons and geography, as well as an entrance to an alien world of insects working together as a superorganism. Beekeeping could become a profession if math was not available. I love traveling and have been to 30 countries so far, but I have always been thinking of visiting Africa, India, and Antarctica. Since my teenage years, and while learning history of the Middle East, I've been fascinated about the idea of traveling through Turkey, Iraq, Iran, Afganistan, Pakistan, and eventually reach India. Such a trip would be rich in experience, history, and culture. Unfortunately, the times that we live in make this idea impractical. If you could have dinner with any person in history, whom would you invite? I wish I could have dinner with Archimedes and Gauss—the two best mathematicians of all times. Lutz Warnke is an assistant professor in the School of Mathematics. Before he joined Georgia Tech in January 2017, he received the 2016 Dénes König Prize from the Society of Industrial and Applied Mathematics. The Hungarian mathematician Dénes König (1884-1944) was a pioneer of discrete mathematics. The main mathematical objects I study are called graphs, which are also known as networks in everyday language. In simple terms, a graph is a collection of points with links (or line-segments) connecting them. Besides being of theoretical interest, graphs have a number of different applications. For example, in network science, they are used to gain insights into concrete networks such as food chains and communication networks. Certain models of graphs are also used to simulate or predict properties of real-world networks, such as Facebook (where points correspond to members, and links represent friendships). Random graphs are my core area of research. These graphs are constructed by adding the links or points in a random way (for example, by flipping coins to decide which ones to add). While some people consider random graphs to be toy models for real-world networks, I like to think of them as idealized reference models that can, for example, guide the study of concrete networks (to help identify which parameters and phenomena are interesting/worth studying, and which are not). I have extensively studied the connectivity properties of random graphs. Perhaps surprisingly, random graphs can undergo “phase transitions,” similar to how water changes its state. Indeed, as we add more and more links to the graph, the size and structure of the connected sets of points undergo quite a dramatic change. They can go from small sets made of relatively few points to a situation where there is a big set containing 1% of all points (and a bunch of smaller sets). To put this into context, if the underlying random graph represented a model for the paths along which diseases spread amongst a population, then the aforementioned sizes of the connected sets could, for example, be vital in predicting the possibility of a pandemic. Nowadays researchers from a variety of different backgrounds study random graphs, ranging from applied mathematics to physics and to biology. Motivated by applications, such interdisciplinary effort often leads to new viewpoints and questions, which I find particularly exciting from the perspective of pure mathematics. What is the work for which you received the Dénes König Prize? I was awarded the Dénes König Prize for my contributions to the study of phase transitions in random graphs that change over time. Achlioptas processes are interesting variants of classical random graph models that are easy to define, but hard to analyze. In a nutshell, the standard mathematical techniques in the area did not apply to these models due to a number of technical difficulties. In joint work with Oliver Riordan I was able to overcome some of these difficulties and prove a number of properties which were hitherto out of reach. Our new techniques have recently also found further applications, enabling us to prove some very precise results for a large class of random graph models. What attracted you to mathematics? As an undergraduate student I was initially interested in theoretical computer science and was fascinated by the idea that random choices can make algorithms faster (and simpler). At first this might sound quite counterintuitive, but one of the basic ideas is surprisingly simple. Indeed, suppose that we have a bag of real and fake coins, of which at least half are real. If we then pick one coin at random from the bag (which roughly corresponds to “blindly” grabbing from the bag), then we fail to find a real coin with probability at most 1/2. Similarly, after two attempts we fail to find a real coin with probability at most 1/2 × 1/2 = 1/4, and so on. In other words, by repeating this random experiment a few times we are very likely to find a real coin (in a very simple way). These and related examples motivated my subsequent course choices. In classes on probabilistic combinatorics and random graphs, I learned about further remarkable phenomena in random discrete structures and a number of beautiful proof techniques. In my opinion the mix of both is quite attractive, and since my graduate studies I have been doing research in this exciting area of mathematics. One highlight has been my work on the so-called “explosive percolation” phenomenon. Loosely speaking, a large number of simulations and heuristics suggested that an important parameter “jumps” (grows very abruptly) in a number of intriguing random graph processes, which was considered a big surprise by many mathematicians and physicists. However, in joint work with Oliver Riordan I was able to mathematically prove that the simulations were all misleading; that is, the parameter always grows in a “smooth” way. This result was published in Science, and it attracted a great deal of interdisciplinary attention (more than 150 citations). For me it was particularly encouraging to see that a number of people outside of pure mathematics were interested in our findings and arguments. What do you bring to Georgia Tech as a mathematics professor and researcher? My research complements the existing strengths in graph theory and the Algorithms, Combinatorics and Optimization program (ACO). Naturally, I thus hope to contribute some new topics to the curriculum. For example, I envision an advanced course in the area of probabilistic combinatorics, which might benefit the research of graduate students in the area of discrete mathematics, theoretical computer science, and the ACO program, say. Such a course could discuss some modern tools and techniques in the area, and I hope to transfer some of my own enthusiasm to the students. Of course, it would be great if some of them develop an interest in pursuing research in the area. The Southeast Geometry Seminar (SGS), is a semiannual series of one-day events focusing on geometric analysis. The 26th annual SGS was held this past February in Skiles. The School of Mathematics' John McCuan and Mohammad Ghomi organized the event, along with Joseph Fu (UGA), Vladimir Oliker (Emory), and Junfang Li (UAB). The first presentation of this program was given by Yuanzhen Shao (Perdue University) on "Degenerate and Singular Elliptic Operators on Manifold with Singularities". Shao was followed by Sungho Park , who studied at Hankuk University of Foreign Studies and Georgia Tech. Park presented "Circle-foliated minimal and CMC surfaces in S3". Abstract of these presentations can be found here. The largest mathematics meeting in the world, the Joint Mathematics Meetings, returned to Atlanta in early January. Over 6,000 mathematicians attended this week long event. Georgia Tech was well represented at the meeting, with over 30 paper contributions, 6 AMS special sessions hosted by several faculty members, panelists, and many more organizers of sessions and events. Two School of Mathematics professors had plenary roles. Michael Damron gave a series of lectures in an American Mathematics Society (AMS) Short Course on Random Growth Models. Damron was also an organizer of an AMS special session. Matt Baker was an invited speaker this year. He presented in the Current Events Bulletin on Hodge Theory in Combinatorics. The Georgia Tech School of Mathematics is proud to have been well represented at the 2017 JMM. The Simons Foundation’s Mathematics and Physical Sciences division named Matt Baker a 2017 Simons Fellow. The Simons Fellows in Mathematics program provides research leaves that allow recipients to take time away from the classroom and academic administrations, promoting intellectual stimulation and heightening creativity and productivity in their research. The recipients of this high profile award appeared in the "Science Times" section of the New York Times this past March. Baker's research will cover Tropical Geometry, Combinatorics, and Dynamics. Baker was also an invited speaker at the Joint Mathematics Meeting in early January. He was also featured in the Get to know the School of Math Prof last year. It’s a long way from Singapore to midtown Atlanta and Georgia Tech, but Ngoc Yen Chi Huynh (Chi to her friends) made the journey thanks to advice from an influential alumnus – who attended the same Singapore private school and went on to run a major airline. Even though she has embraced Southern humidity, sweet tea, and Saturdays at Bobby Dodd, she praises the Institute for its “international environment,” thanks to its student diversity. Huynh is graduating with a B.S. in Mathematics and will seek a Ph.D. in the field. What attracted you to Georgia Tech? I was able to attend United World College South East Asia (UWCSEA) in Singapore, thanks to the generosity of Robert A. Milton, a Georgia Tech and UWCSEA alumni, along with his wife, Lizanne. I learned about Georgia Tech through my many conversations with Mr. Milton. He praised the experience he had at Tech and gave me a good impression of the Institute even before I started making a list of colleges. He knew about my interest in pursuing a major in math or one of the sciences, so he suggested I should apply to Tech. How would you describe your life before enrolling in Georgia Tech? My high school was one of 13 United World Colleges, a system of high schools committed to creating a culturally diverse environment by allowing students from around the world to study together. As such, my high school experience was quite colorful and memorable. However, it was also a somewhat idealistic environment, so I sometimes felt I was living in a bubble. Georgia Tech was a nice change for me. It is still a very international environment, but closer to reality. I learned how to balance having a long-term goal and allowing yourself to live in the moment. During my first couple of years, I was too obsessed with the life I had planned for myself after college. I concentrated on graduating early. I became unhappy because I gradually realized I might have chosen the wrong major – at the time, I was studying industrial engineering. Thanks to the advice of friends, I decided to stop worrying and take classes that actually interested me, including math. This detour helped me not only to enjoy my time in college a lot more, but also to find the major that I really want to pursue. What surprised or disappointed you the most about Georgia Tech? I was surprised the most by how religious a lot of my friends are and how everyone seems to be very respectful of others’ beliefs. That made for a vibrant campus scene. The one thing that disappoints me the most is the lack of support for international students on campus. That’s despite the size of this community. I know that the Office of International Education has been working hard to create a friendly, enriching environment for international students. However, in terms of experiences outside the classroom such as summer internships and research, I do not think there are a lot of publicized sources of help for these students on the Tech campus. Two professors in the School of Mathematics: Professor Christine Heitsch, who taught Foundation of Mathematical Proof and advised me on research, and Professor Kirsten Wickelgren, who taught me complex analysis and abstract algebra. They both gave me valuable career advice. They had an impact on me because they are very successful women in a male-dominated field. They helped me believe in myself and my prospects as a mathematician. My most vivid memory of Tech has to be my first football game in 2013, the Georgia vs. Georgia Tech game after Thanksgiving. This was the first time I actually experienced school spirit as I got to watch what goes on in a football game: the marching band, the cheerleaders, the color guards, etc. I was somewhat in awe because this was something I only saw in movies. Participating in the game and its traditions really made me feel like I was finally a part of Georgia Tech. If you participated in experiential learning activities, what was the most valuable outcome of your experience? I have been involved in a research project on RNA folding in viruses with Professor Heitsch since spring 2015. When it comes to study abroad, I was part of the Language Business and Technology (LBAT): France program in Paris and Nice in summer 2015. This was an amazing experience during my time at Tech, as I got to immerse myself in the French culture and advance my French language skills. Thanks to this program, I was able to earn a minor in French without adding to my already busy schedule. On the basis of your experience, what advice would you give to incoming freshmen at Georgia Tech? I would advise incoming freshmen to not shy away from challenges, whether it is a harder version of a class or a research opportunity. What fun is there to be in a situation where you don’t have to put in any effort to be good? It’s also completely okay to not know what you want to do as a freshman. I thought I wanted to study industrial engineering when I first enrolled, but I changed my major at the end of my sophomore year. 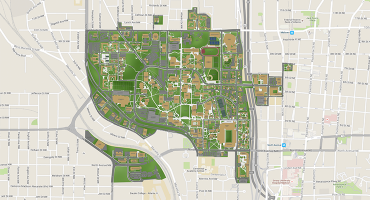 What feedback would you give to Georgia Tech to improve the campus experience for future students? Because of Tech’s size, it is sometimes difficult, especially for new and international students, to navigate the administration. It would help tremendously if there were more people among the faculty who have a good understanding of the challenges for new and international students. In addition, I think the School of Mathematics is going in the right direction by designing a curriculum that allows math majors to declare different concentrations depending on their interests and long-term goals. However, from talking to several younger math majors, many are worried about what they can do outside of class to educate themselves about mathematical research. If the school could assist them in finding these opportunities along with choosing the right concentration, we could produce even stronger math majors. I am heading to the University of Illinois at Urbana-Champaign (UIUC) Ph.D program in mathematics. Georgia Tech has prepared me very well, both in terms of the knowledge I gained during my time here and the skills not taught in the classroom. In mid-April, Georgia Tech welcomed over 300 students who competed at the 2017 Georgia Tech High School Math Competition. Accompanied by teachers, coaches, and parents, the participants represented 36 high schools from around Georgia and nearby states. With the time and commitment of Georgia Tech's faculty and staff, and students, both graduate and undergrad, the School of Math (SoM) successfully upheld this annual Georgia Tech tradition, dating back to 1958. The SoM extends a big thanks to this year's organizing committee who made this event possible: Chris Jankowski, Sharon McDowell, Sudipta Kolay, George Kerchev, Shane Scott, and Annette Rohrs. Their hard work, along with that of over 30 volunteers, ensured this event was a major accomplishment. This year's competition conducted 4 exams, covering a wide range of material, including algebra, geometry, combinatorics, number theory, and basic calculus. Each school was allowed to send up to five teams with five students on each. The competition was fierce, and the top scores in the individual and team levels were very close. Charles Wang was enjoying success in science long before he set foot on Georgia Tech’s campus. When he was at at Walton High School in Marietta, Georgia, his Science Bowl team made three appearances at the national finals. Now, as he departs Tech, he’ll be leaving with two Bachelor of Science degrees, in Chemistry and Computer Science. He will have almost as many credits as a mathematics major after discovering a love for math during his time at Tech. He’ll pursue that newfound passion as a Ph.D. student in math at the University of California, Berkeley. Wang is also the recipient of the 2017 Love Family Foundation Scholarship, the highest award for a graduating senior, and the Robert A. Pierotti Memorial Scholarship, presented to a College of Sciences senior who excels in academics and research. Georgia Tech has been very affordable thanks to the HOPE/Zell Miller Scholarship. I’ve been able to acquire an excellent education without much financial hardship. I also took classes at Tech during high school, which helped me make the transition between high school and college. Georgia Tech is also very good academically. I participated in Science Bowl and Science Olympiad in high school, and I took AP science and chemistry courses at Georgia Tech. I have always been fairly certain that I wanted to go to graduate school, and attending Georgia Tech has confirmed this for me. My hobbies include playing instruments (violin, piano, guitar), singing, and outdoor activities such as hiking. The most important academic lesson has been to prioritize and enjoy learning, rather than optimizing every little detail to try to boost my grade. Ironically, when I worried less about my grades, I seemed to do better. It took me a while, but I realized this approach applied generally to life. I tend to worry so much about optimizing every little detail that I didn’t have time to stop and enjoy things. Georgia Tech exceeded my expectations in a particularly important way: I have always been impressed by the willingness and availability of professors to meet with me. I was pleasantly surprised at how easy it is to interact with professors. While Georgia Tech is a large school, I have never felt lost in the crowd. I could always get help if I needed it. My only complaint is something always seems to be under construction on campus, but this is a minor nuisance. I’m sure I could find things to be disappointed about, but I don’t really feel the need to look for disappointment. During my second year, Art Janata and Mira Josowicz invited me to join their research group. This was my first research experience, and I learned a lot – 99% being stuck and frustrated, and 1% success – that motivated me to pursue graduate studies. Ying Xiao, a graduate teaching assistant for a computer science class, created extremely challenging homework problems for my algorithms class and expected nothing but the best from each student. Because of his efforts, I discovered my interest in math. Although I never took a class with Sung Ha Kang, she helped me with many problems and gave me a lot of good advice for school and life in general. Josephine Yu has been my teacher and research mentor for almost two years. Her tireless, patient instruction and supervision has helped me overcome many obstacles, and her constant support has encouraged me to do things I never would have imagined. I have two particular memories. The first is publishing my first paper. It was the culmination of about a year of work and frustration, and I was overjoyed to see my efforts pay off. The sense of closure that came with submitting the paper was extremely rewarding. The second is receiving my acceptance to do a Ph.D. at the University of California, Berkeley, which has always been one of my dream schools. I participated in undergraduate research for four years (two in chemistry, two in math) and studied abroad in Hungary with the Budapest Semesters in Mathematics program. For my chemistry project, I studied the deposition of atomic gold clusters onto polyaniline. I gained experience in experimental design, mechanical engineering, and electrochemistry. For my math projects, I studied a family of polytopes, which can be thought of as generalizations of polygons in higher dimensions. I learned a lot of math during this project, including how to write scientifically and use literature effectively. My math classes in Hungary were crucial in my decision to study mathematics rather than chemistry, and I thoroughly enjoyed the experience of living in Hungary for a semester. Georgia Tech offers many amazing opportunities, but they’re not going to come to you. You have to go after what you want in order to get it. The undergraduate years are the best for exploration, academically and socially. It’s not enough to do well in easy classes and excel at easy tasks. Get out of your comfort zone as often as possible – without burning out – and don’t be afraid to admit that you don’t know how to do something. We all have to remember that people who perform badly are not bad people. We should strive to be understanding and tolerant of everyone. One thing that helped me was feeling that other people believed in my ability to succeed. The support of others helped me overcome self-doubt. I will go to graduate school to pursue a Ph.D in mathematics at the University of California, Berkeley. Georgia Tech has prepared me by giving me a very good education in math and giving me many opportunities to perform research; attend seminars, conferences, and workshops; and take interesting and challenging classes.